What better way to experience the Florida Keys and the historic Overseas Highway than on a Harley? Enjoy the freedom of exploring our islands that only a motorcycle can provide. Keys Cycles is the only shop in the Keys offering motorcycles for rent. 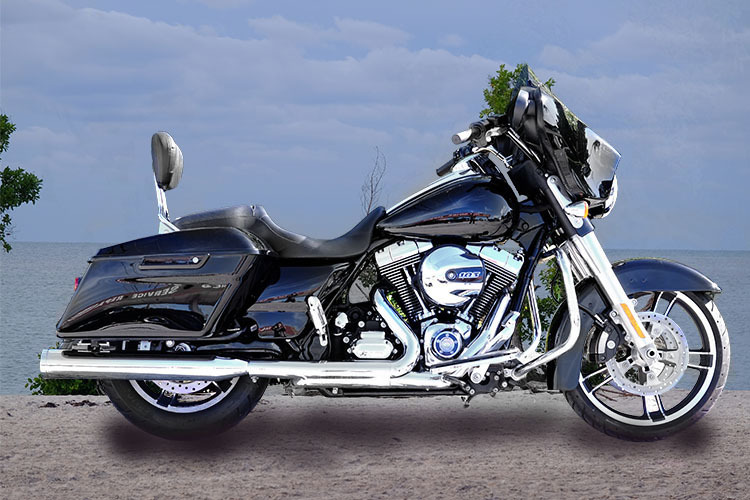 We rent a range of Harley-Davidson models from 8 hours to 7 days or longer. Rental rates are the same for all our bikes. Please call us anytime to make a reservation, or complete the form below with your desired dates and we'll get back to you by email or phone. Due to insurance regulations combined with Harley Davidson’s weight limit recommendations, please don’t ask if your combined weight is more than 425 lbs. or if driver weight is over 275 lbs. Drivers in excess of 250 lbs. are limited to stock handle bars. Thank you for your interest in renting from Keys Cycles. We’ll be in touch soon. "Sweet & Low" is a great bike for shorter riders or the ladies. Seat height lowered a full 2"
"Keys Cruiser" is one sweet ride. "Blue Suede" is our completely stock Harley Road King. "The Glider" is one sweet ride!! “Spyke’s Bike” is our tricked out Street Glide. This is one badass ride!! PLEASE NOTE that for safety reasons the maximum combined rider weight allowed on our rentals is 450 lbs. For complete rental details, view our Terms and Conditions and our Cancellation Policy. Call us anytime to check dates or make a reservation, or complete the inquiry form below and we'll get back to you. For 8-hour rentals, the earliest pick up time is 9 a.m. and the latest return time is 5:45 p.m. All other rentals are 9 a.m. to 9 a.m. unless other arrangements are made in advance. Thank you for your interest in renting with Keys Cycles! We’ll be in touch soon.